So you bought a particular car because it looks great on the outside. You love the color, the style looks cool and you know it turns heads when you drive down the road. And there is a lot you can do to the exterior of a car to make it look great: adding pinstripes or graphics, replacing stock rims with designer versions and adding well-done details like light kits, spoilers, hood scoops and more. However, there’s one thing you should keep in mind: when you’re driving down the road, how much of your car’s exterior can you really see? Shouldn’t the interior of your car match the exterior in terms of showing your personality? Even if you drive a boring sedan without all of the flashy extras, you can still decorate the interior of your car to show off your personal style. 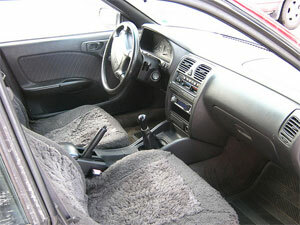 It’s not difficult to customize the interior of your car if you have a limited budget. Choose a theme, such as your favorite color, sports team or a pattern and go from there. Start with tiny details, like a steering wheel cover. Auto parts and specialty stores offer steering wheel covers in everything from leather to fake fur, in all colors and motifs. Add some luxury to the wheel with a leather or wood-grained cover, or go whimsical with an animal print piece. If you want to go even further, invest in a car seat cover. Covering the seats with a custom cover not only protects your vehicle’s seats from stains and damage, but it also reflects your personal style. Get covers that match the steering wheel cover or choose something easy to clean and stain resistant, like neoprene, if you have kids or engage in activities that could leave your seats dirty; all you need to do is pull off the cover to clean it and your wheels stay neat and tidy. Some seat cover companies will even allow you to personalize your cover, adding your monogram or name or even a favorite design. The floor is another place you jazz up when decorating your car’s interior. A set of colorful floor mats will protect the floor while injecting some lively pizzazz into your car. You can always buy floor mats emblazoned with your vehicle maker’s emblem or you can show some style with an unusual color, a fun motif or pattern or even a personalized set. Just like in your home, adding accessories to your car interior completes the look and adds style to the space. Just be careful, though, that you don’t add anything that will block your view of the road or keep you from driving safely. For example, a dash ornament can add some fun to your car. The swaying hula dancer or bobble head dog is always a popular choice, but get creative! Attach a figurine from your favorite movie, sports team, television show or cartoon to the dash with double sided tape. Or take a cue from Volkswagen and add a small bud vase to the dash of your car to hold a flower on the dash. You can also hang decorative elements from the rearview mirror, but make sure it doesn’t block the windshield – and make sure it’s legal in your area. Another place where you can decorate your car and still take a cue from your home? Organization and storage. You know you need to carry an emergency kit, so why not make it decorative and functional? Use a decorative container to hold your emergency supplies in the backseat; add fun throw pillows into the back to add style while also serving as a functional resting spot for your passengers. If you drive a luxury car – or you want to turn your vehicle into a showpiece – you may not want to add stock items from the auto parts store. That’s okay: there are designers out there who will design and install completely custom interiors for your car. If you want canary yellow leather seats or bright pink door panels, you can request it. These services aren’t cheap, though and might not be what you had in mind for your aging Camry. So the next time you’re at the store picking up a wheel hub assembly, new wiper blades or an air filter, see what kind of decorations you can find for your car’s interior. Turn your wheels into a true reflection of your personal style.